Sunday January 5 1908 Mother is 82 years old today. It is a beautiful winter day. I was busy about the work most of the forenoon I read and wrote in afternoon and evening. Went to bed early. We hear Mrs [Kover?] is sick down at Eds Monday January 6 1908 It was such a fine day. Will went in town to a board meeting and I did the washing soon after dinner we fixed things up in the garret where the mice had been at the seed corm. Mary & Jennie came out for awhile. I did the ironing in the evening. Billy cutting down trees. 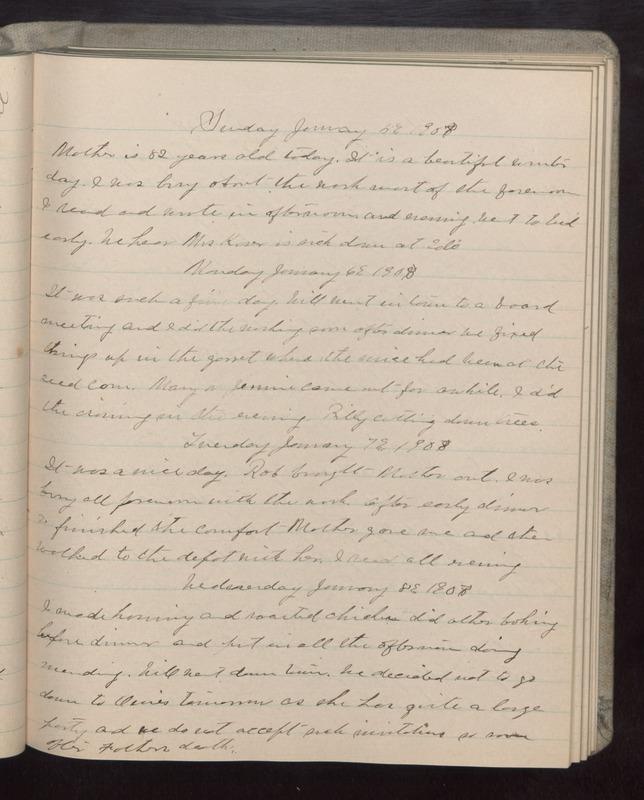 Tuesday January 7 1908 It was a nice day. Rob brought Mother out. I was busy all forenoon with the work. After early dinner I finished the comfort Mother gave me and then walked to the depot with her. I read all evening. Wednesday January 8 1908 I made [illegible] and roasted chicken did other baking before dinner and put in all the afternoon doing mending. Will went down town. We decided not to go down to [illegible] tomorrow as she has quite a large party and we do not accept such invitations so soon after Fathers death.